The following was published on SI.com on November 14, 2010 under the headline “NL rookie class unusually deep, talented.” It is one of several of my older articles that was lost in the site’s redesign in June 2014. I’m republishing it here, unaltered, from my original submission, prior to any editing by SI.com’s editors. Italicized sections below are from the original text. In writing my Awards Watch column this season, I often found myself struggling to find five, or even three worthy players to round out my list of American League Rookie of the Year candidates. That stood in stark contrast to the crop of rookies in the National League, which not only provided stiff competition for my top five spots, but was large and diverse enough that one could assemble a strong 25-man roster from this year’s National League rookies alone. With the Rookie of the Year awards due to be announced on Monday, that got me thinking. What would that 25-man roster of NL rookies look like and, if assembled, how well could it have done in this year’s standings? To answer that question, I have to set out some ground rules. First, I’m looking for a team that could play a full season, not an All-Star game. Thus, I’ll need my position players to total 162 games played at each position, my starting pitchers to total 162 games started, and my bullpen to add enough relief innings to combine with my starters to give me a total of 1,458 innings on the season (nine innings times 162 games). In order to reach those totals, I’ll likely have to expand my roster beyond 25 men, but no team uses just 25 men over the course of an entire season, so this remains within the realm of reality. With regard to position, I will give myself a bit of flexibility. For example, though Buster Posey started 30 games at first base this year, I will count all of his games toward my catchers, and if an outfielder has experience in a pasture other than his usual one, or an infielder has experience at a relatable position (a third baseman who has played first, a shortstop who has played second or third, etc. ), I’ll give myself permission to use that player to fill in the necessary games at those positions as needed. I will not use starting pitchers in my bullpen unless they have actually thrown those innings in relief, and vice versa for relievers starting. However, if a pitcher has both started and relieved this season, if I include him his starts will count toward my rotation and his relief innings will count toward my bullpen. I won’t attempt to isolate his performance in either role. With that established, I need a total-production metric to allow me to measure the performance of my roster relative to an existing standard. Joe Posnanski examined some of the issues with the two different versions of WAR (Wins Above Replacement) earlier this season. I share his belief that FanGraphs’ WAR weighs defense more heavily, which I find problematic given how inexact even advanced fielding metrics are relative to our ability to parse out value from pitching and hitting. I also find FanGraphs’ WAR problematic because it uses Ultimate Zone Rating (UZR) for its defensive component, but UZR doesn’t rate catchers and doesn’t take into account several key aspects of paying first base. Baseball-Reference’s WAR uses Total Zone Runs for its defensive component, which at minimum has the advantage over UZR of rating catchers and seems to be more gently applied to the overall WAR stat. Baseball Prospectus’s VORP is an offense-only statistic, but it’s counterpart WARP (Wins Above Replacement Player, which pre-dates WAR by roughly a decade) not only includes fielding, but its fielding component, Fielding Runs Above Average, was overhauled last year to employ play-by-play data, giving new life an old favorite. I’ll stick with the dame I came in with and use WARP. For players with more than the required amount of games played, I will use a pro-rated portion of their total WARP. Those partial-season statistics are in italics below. WARP, again, is Wins Above Replacement Player. Replacement level is defined as the production that can be expected from a freely available player, be it a non-prospect promoted from Triple-A or a player placed on waivers or released by another team. A replacement level team is thus, essentially, the worst major league team possible. The worst major league team in the modern era was the 1916 Philadelphia A’s, who had a .235 “winning” percentage. That translates to 38 wins over a 162-game schedule. According to Baseball Prospectus’s definition of WARP, a team that is replacement level across the board would likely win no more than 25 games. I can thus use that 25 wins as the starting point for my team, adding the total WARP from my roster above to figure out just how many games this team might have won. Adding up the 35 WARP totals above, I find my NL All-Rookie team was 73.92 wins above replacement in 2010. If you add those 74 wins to the 25-win baseline you’ll find the team above, comprised exclusively of National League rookies, would have won 99 games, more than any other team in baseball in 2010. So how deep was the 2010 National League rookie class? So deep you could not only assemble an entire 25-man roster (with ten alternates) of NL rookies, but future stars such as Pirates third baseman Pedro Alvarez, Phillies outfielder Domonic Brown, Reds righty Mike Leake, and Mets hurlers Jenrry Mejia and Jonathon Niese didn’t even make the team, nor did hot-hitting rookies Tyler Colvin of the Cubs or Jon Jay of the Cardinals (all had inferior WARP-per-game rates to the players listed in their positions above). It was so deep that it could absorb Stephen Strasburg’s elbow injury and still have a deep and effective rotation. So deep that the resulting roster would have had the best record in the major leagues in 2010, won any division in the game, and had home-field advantage throughout the playoffs. That deep. Thanks to Baseball Prospectus’s Colin Wyers for filling me in on the finer points and current formulation of WARP. 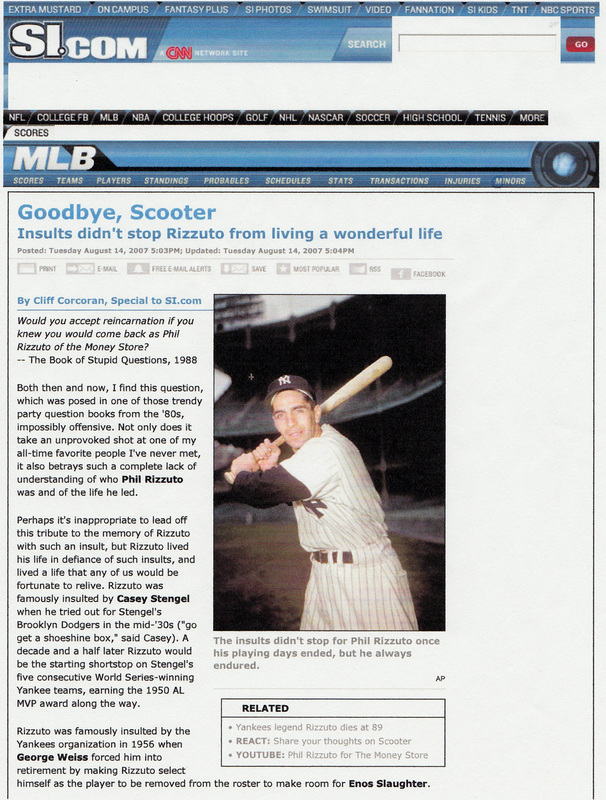 The following was published on SI.com on May 18, 2007 as part of the site’s short-lived Fungoes blog for which I wrote the Friday “Wild Card” entries. It is one of several of my older articles that was lost in the site’s redesign in June 2014. I’m republishing it here, unaltered, from my original submission, prior to any editing by SI.com’s editors. Last Tuesday, Barry Bonds hit a solo home run off Tom Glavine for the only Giants’ run in a 4-1 loss to the Mets. That home run put him exactly ten behind Hank Aaron’s career home run record of 755. Since then, Bonds has gone just 2 for 16 (a single and a double), but walked nine times. Still, it’s now all but inevitable that Bonds, who entered the season 21 homers shy of Aaron, will break Aaron’s record this season. The thought of the surly, unlikable Bonds, who allegedly used illicit means to get into this position, breaking the record the gentlemanly, heroic Aaron claimed in the face of intense racial hatred conjures up a wide variety of unpleasant reactions in nearly every baseball fan. Most fans, consciously or not, still think of Roger Maris’s 61 home runs, not Bonds’s 73, as the single-season record. I don’t have the time, space, or energy to get into the legitimacy of Bonds’s accomplishments right now, but it seems as though the closer Bonds comes to Hank’s 755, the more the mind races for ways to defang, if not outright undermine his accomplishment. This all got me thinking about the nature of sports records in general. When Maris was bearing down on Babe Ruth’s single-season mark of 60 home runs in 1961, there was a similar recoiling by baseball purists who hadn’t anticipated Ruth’s homer marks ever being broken, and certainly not by a flash-in-the-pan such as Maris. As Maris neared the record, then-Commissioner Ford Frick, who was once Ruth’s ghostwriter, famously declared that Maris, who was chasing Ruth in the first year of expansion for which the season had been extended from 154 games to 162, would have to break Ruth’s record by the Yankees’ 154th game or suffer the cruel indignity of having his mark listed separately as the “162-game record” (no, Virginia, there never was an asterisk, now go tell Billy Crystal). Maris had just 58 homers after 154 games and thus his record, which is now considered the “pure” record, was listed separately until Fricks’ distinction was abandoned in 1991. History (and Crystal) vilified Frick for that decision, but here’s the thing: statistically speaking, Frick was right. Ruth hit 60 home runs in a 154-game season and Maris hit just 58 in a 154-game season, then, given an extra eight games, hit three more. If the point of the single-season home run record was to honor the player who could hit the most home runs in a limited number of opportunities, Frick’s method was the right one. Of course, if that was the point, the record would belong to Bill Lefebvre, who, as a rookie pitcher for the Red Sox in 1938, hit a home run in his only plate appearance of the season. Need a larger sample? What about outfielder Ed Sanicki, who hit three home runs in 15 plate appearances for the Phillies in 1949? Or Ted Williams, who hit 13 homers in 110 plate appearances (8.46 PA/HR) after returning from Korea in 1953. Heck, if Frick was so interested in honoring home run frequency, he should have shifted the record from Ruth’s 60 in 1927 (11.52 PA/HR) to Ruth’s 59 in 1920 (10.42 PA/HR). Of course, that’s not the point of the single-season home run record. The point isn’t how often, it’s how many. Cumulative records such as the single-season and career home run records are more primal than rate-based records such as batting average or ERA. Quick, who holds the single-season batting average record? Come on, this was the single statistic that was used to compare hitters for nearly all of the twentieth century. When a hitter leads the league in batting average, he’s not called the “batting average leader,” he’s the winner of the batting crown, he leads the league in hitting. Being a .300 hitter is supposed to say something fundamental about a player’s ability, if not their character. Got an answer yet? Is it Hugh Duffy’s .440 in 1894 or Nap Lajoie’s “modern” record of .427 in 1901? What’s the minimum number of plate-appearances required for this record anyway? See what I mean? That’s not “most,” that’s math. The home run record is most, and the man who hit the most home runs in a single season as of October 1961 was Roger Maris. It didn’t matter that he had more chances than Ruth, the fact was no man had ever hit 61 home runs in a single season of any length, it had never been done. That’s what a record is, something that’s never been done. When Mark McGwire hit 70 in 1998, that had never been done, and if say you weren’t as awed by McGwire’s total as he was by himself, you’re probably lying. Barry Bonds broke McGwire’s single-season record in 2001 and, though by then the baseball world had become jaded by allegations of steroid use and by the onslaught of 60-plus home run seasons (Bonds’ was the fifth in four years and Sammy Sosa would make it six that same year), no one had ever hit 73 home runs in a single baseball season before Bonds did it that year, and no one has done it since. That’s the definition of a record. I remember watching the 1988 Summer Olympics in Los Angeles when I was a kid and seeing Ben Johnson run 100 meters in 9.79 seconds. No man had ever been recorded traversing that distance in so short a time in the entirety of human history. Three days later, it was revealed that Johnson had tested positive for the steroid Stanozolol. Johnson was stripped of his gold medal in light of his positive test, which I understood, but he was also stripped of his world record, which I didn’t. I understood that he had cheated, but the simple fact was that no man had ever been clocked running 100 meters in less time. How could the Olympic Committee pretend that had never happened? It’s one thing to disqualify a boxer from a fight, or a player or team from a game, but a sheer physical accomplishment like that could never be disqualified in my mind. So sometime in the next month or two, Barry Bonds will hit his 756th career home run, and there will be much pulling of hair, gnashing of teeth, rending of garments, and crunching of numbers, but the simple fact will be that no man has ever hit 756 regular season home runs in the major leagues, ever, and that, despite the taint and dishonor that Bonds may bring along with him to that summit, is a record. The following was originally published on SI.com on February 13, 2009 under the headline “Was it the PEDs or the Park? A look inside A-Rod’s Texas numbers.” It is one of several of my older articles that was lost in the site’s redesign in June 2014. I’m republishing it here, unaltered, from my original submission, prior to any editing by SI.com’s editors. Given that this is an incendiary topic, I want to point out here that the intention of this article wasn’t (and isn’t) to absolve Rodriguez of wrongdoing, he’s very clearly guilty of extensive performance-enhancing drug use, but to attempt to discern how much, if at all, that drug use aided his performance on the field. While others debate the sincerity and completeness of Alex Rodriguez’s confession to Peter Gammons on Monday, let’s push past the he said/she said between Rodriguez and Selena Roberts, past the garment-rending over the impact of his drug use upon the history and integrity of the game, and past the love/hate relationship baseball fans have with Rodriguez, a superstar bizarrely burdened with intense insecurities. Instead, let’s take a cold, hard look at the seasons during which Rodriguez admitted he had experimented with banned substances to see what impact, if any, those substances had on his performance on the field. If we take Rodriguez at his word, his three years as a Texas Ranger from 2001 to 2003, were the only seasons during which he used illegal performance-enhancing drugs. In those three seasons, he hit 156 home runs. By comparison, in his last three seasons with the Mariners, from 1998 to 2000, he hit 125 and in his first three seasons with the Yankees, from 2004 to 2006, he hit 119. In those six bookend seasons, he surpassed 42 homers just once, but in his three seasons in Texas he hit 47 or more every year. So yes, Alex Rodriguez hit more home runs when he was juicing, but was it because he got his power from a pill, or were there other factors at work? Consider the fact that Rodriguez missed just one game in his three years with Texas, playing in 485 of the Rangers’ 486 games over that span. In his first three seasons with the Yankees, he played in 14 fewer. In his last three seasons with the Mariners, he played in 47 fewer. Rodriguez told Gammons on Monday that a large part of his motivation for experimenting with banned substances was his desire to be able to play every day through the hot Texan summers. In helping him achieve that goal, the drugs clearly worked. Those figures tell us that, not only did Rodriguez take the field more often during his three drug years than in the three-year periods immediately before and after, but he also went deep more often, homering more often than once every 14 plate appearances during his time in Texas. Yet, while there’s a strong correlation between Rodriguez’s drug use and playing time, the source of Rodriguez’s power surge lies elsewhere. Safeco Park, which Rodriguez’s Mariners moved into in mid 1999, is a pitchers park, as was the remodeled Yankee Stadium, the latter of which was particularly hard on right-handed power hitters such as Rodriguez. The Ballpark at Arlington, on the other hand, is a launching pad. Factor in a year and a half of play at the similarly homer-happy Kingdome in 1998 and 1999, and those home run rates above would seem to correspond to park factors as much or more than to drug use. Here we see that Rodriguez was a better home-run hitter on the road during his last three “clean” seasons with the Mariners than he was during his three drug years with the Rangers. Those two periods offer a particularly strong comparison because Rodriguez spent all six years in the AL West. Thus, save for moving roughly 12 percent of his road games (10 of 81 annually) from Texas (as a visiting Mariner) to Seattle (as a visiting Ranger), his road games were played in essentially identical environments. Rodriguez went deep on the road approximately 8 percent less often as a Ranger while playing 12 percent of his road games in a less friendly home-run environment. Given that his Ranger years coincided with his peak-age years (ages 25 to 27), during which an increase in power would have been expected even without the help of illegal substances or a friendlier home park, it’s difficult to attribute any of his overall increase in power during those years to the drugs. I could have listed other stats that exhibit the same trend, both adjusted and non-adjusted (WARP, Runs Created, Runs Created Against Average, Runs Created Per Game, unadjusted OPS, Gross Production Average, etc. ), but there was no need. The trend was real and four years running. That analysis of Rodriguez’s performance trends was untainted by any knowledge or suspicion of his drug use while with the Rangers and, just as I have now done four years hence, wrote off the apparent surge in Rodriguez’s numbers while in Texas as park-driven while digging beneath those gaudy counting stats to reveal a modest decline in his overall production during his three years in Texas. Put this all together, and it’s clear that, if he is indeed telling the truth about his drug use being limited to his three years in Texas, the only noticeable benefit Alex Rodriguez derived from his experimentations with banned substances was his ability to play 485 of the Rangers’ 486 games during his three years with the club. That’s no small thing. There are some who believe that the must undervalued statistic in baseball is games played. It’s irrefutable that Rodriguez’s ability to take the field every day as a Ranger enabled him to put up the remarkable counting stats he compiled in a Texas uniform, chief among them his 57 home runs in 2002. Still, there’s no evidence that the drugs made him any more powerful, and significant evidence that his rate of production actually declined during his doping years. Rather, it was the ballpark, not the drugs, that seems to have been the key to Rodriguez’s statistical surge (34 of his 57 homers in 2002 came in Arlington where he homered once every 10.6 PA vs. once every 15.7 PA on the road in 2002). Whether or not that’s enough to convince anyone, myself included, that his statistics remain “untainted” is, unfortunately, another matter entirely and one far less likely to be settled in Rodriguez’s favor. A recap/reaction to Friday evening’s Braves-Cardinals Wild Card game with thoughts on the controversial infield fly call and how that call exposed the flaw in the one-game-playoff format. A preview of the A’s-Tigers series which kicks off tonight at 6pm EST. A preview of Game 1 of that A’s-Tigers series, which, again starts tonight at 6pm EST. A preview of Game 1 of the Reds-Giants series, which follows tonight at 9:30pm EST. A preview of the Yankees-Orioles series which kicks off on Sunday at 6pm EST. Also, here are the SI.com “experts'” picks for the four division series.